Yesterday is going to rank among the strangest of days I have been through in my life. For starters I am rather sick, so much so that I don’t have much of a voice right now. How I am going to record AggroChat tonight is really beyond me. It might be one of those episodes where I pester Kodra to be the MC, and I just add some gravelly sounding flavor commentary here and there. So being sick and perpetually feeling like the room is moving aside… I posted a slightly unusual post for me yesterday that to some extent set the community on fire. On a good day I get maybe 150 readers hitting my blog… yesterday I had well over 700. Good or bad what I said seemed to strike a chord with folks… and it was very strange to be riding that out. The thing that scared me however was the kinds of reactions I got. Everyone was extremely supportive, almost surprisingly so. The aspect that was a bit frightening is how everyone felt the desire to post their own comments on the blog in question. The blogger commented that I had sent my “gang” after her, and in truth I didn’t realize that I had one. If we are to form a gang however, we will have to wear awesome hats. Honestly that sort of power scares me more than a little. I am not sure if I want the ability to without meaning to call down a nuke of their blog from orbit. It just seems strange to be able to move that many people to action… especially when I wasn’t really asking for it. My chief goal was to have some voices that were being silenced heard, and that was the result of yesterdays post. Everything that occurred afterwards, while I deeply appreciate the support, felt like maybe it got completely out of hand. Over the last few days I have been lucky enough to be playing the current Sky Saga alpha. I have to say I really dig the game but it is also one that is somewhat difficult to sum up quickly in words. 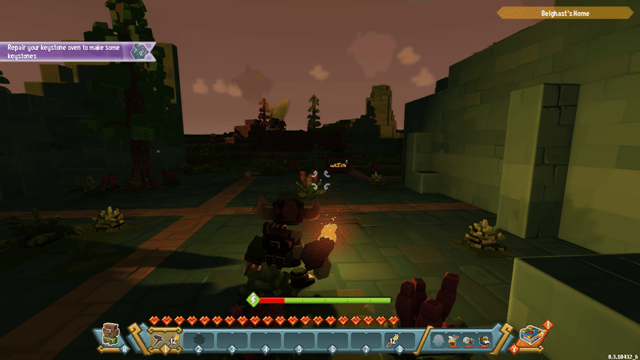 The game itself feels extremely like the various “next generation minecraft” offerings that have sprung up recently. The entire game is voxel based, and if I had to guess is likely using the same VoxelFarm technology that Landmark does. There are moments that in playing lots of landmark… the engine feels very similar in the way it draws nearby surfaces. If I could sum it up best I would call it Minecraft with a purpose, in that there are constantly objectives and mini-quests to be accomplished as you move through the world. 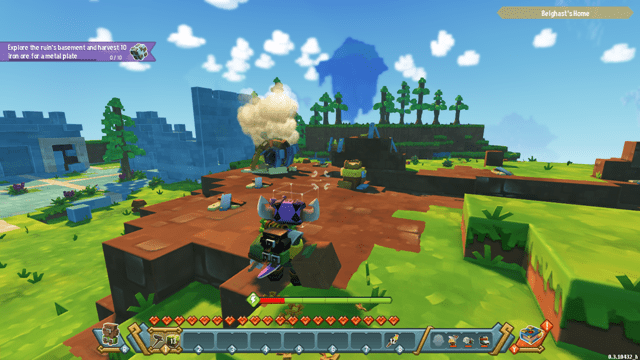 The gameplay starts on a tutorial island that ultimately serves as your home base. Anything you build here persists between plays of the game. 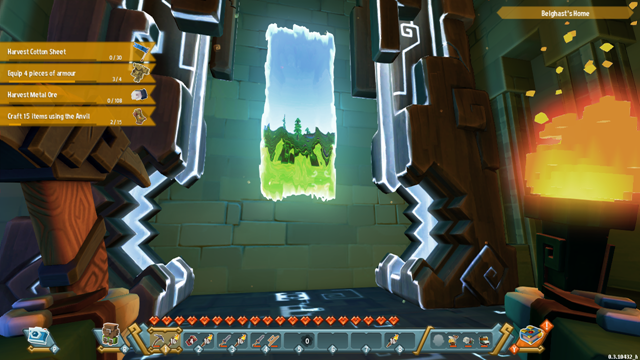 The majority of the game play revolves around collecting key fragments, melding them together into a new key and then using that to open up portals to new areas. From here you have access to explore new realms, with enemies, treasure, and resources not available in your home dimension. The game itself is the pinnacle of charming as you play a either a human, cat person, or dinosaur person that gives you some limited customization options. 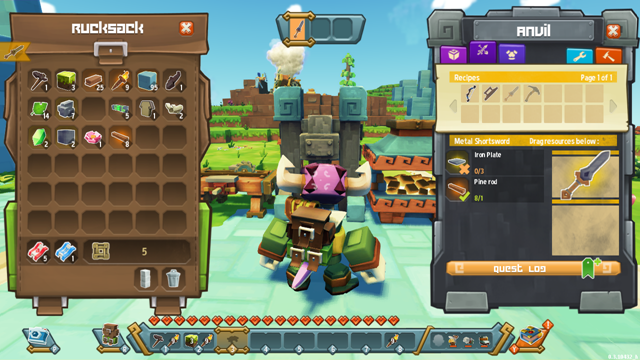 You progress through the tutorial by crafting various implements that you will need like a pick axe, or a sword. The thing that stands out is how good the world feels. The art style and design ethic are carried through every element that you interact with. That means that everything from the breaking of a block to the swing of your sword feels like it belongs in this setting. There are two main issues that I have with the game design right now. Firstly when you craft a key it is a one shot item granting you essentially a one way trip to a new realm. When you exit that realm for any reason, be it porting back to your home dimension or logging out of the game… you lose all progress in the other realm. This makes it a hard game to pop in and out of for short periods of time. I feel like I need to get the most out of every key for fear that I waste the resources that it took to craft it. The other problem is that when you die you lose everything on your person that has not been dumped in a hotbar slot. 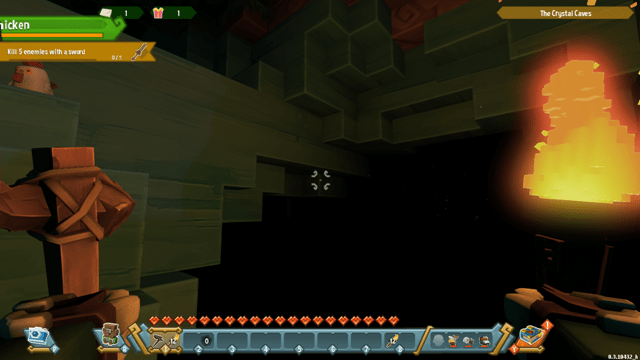 The combination of these two make it extremely frustrating because there is no real way to pop back to your base of operations to “save” items in a chest without wasting the portal stone that got you to the new realm. The other big problem I am finding is that resources seem exceptionally limited. Your starter island has a trove of material to get you started, but the problem is that most of these are in extremely small quantities. The minecraft way of gathering resources is to just find a place and start digging. The problem is I did this for a good thirty minutes last night and encountered absolutely nothing but stone. The world seems extremely static and once the resources are depleted it is essentially a waste to stay there. The frustrating thing here is that you get dumped onto a realm with a number of other players, and essentially you are all competing for the same few items. You may luck out and get a realm with fresh spawns… or you might get a world that is completely depleted meaning you just wasted your own resources getting there. I can already see that more than likely purchasing resources is going to be a key revenue generator for this game. I have roughly another week to play this game during the current alpha test phase. My hope is that I can manage to sort out some of the issues I am having. The game that is here however is extremely enjoyable and it makes me way to play more of it. I just feel like somehow I am missing something when it comes to how to get the resources I need to complete quests. My hope is given time I will figure out the nuggets of information that I happen to be missing. I don’t really want to take to the wiki pages quite yet, because the game itself has a rather nice in game wiki feature to explain what everything you encounter does. I feel like I am just missing some key unlocks in the “chronicle” as they call it that will help me connect the dots. If you have access to the game I highly suggest you give it a shot. I will be righting a more complete review later once I feel I have mastered more of the basics.